“I did indeed. I said Now Max, this is going to be an adventure trip – not a relaxing trip. Are you ok with that?" “Huh. 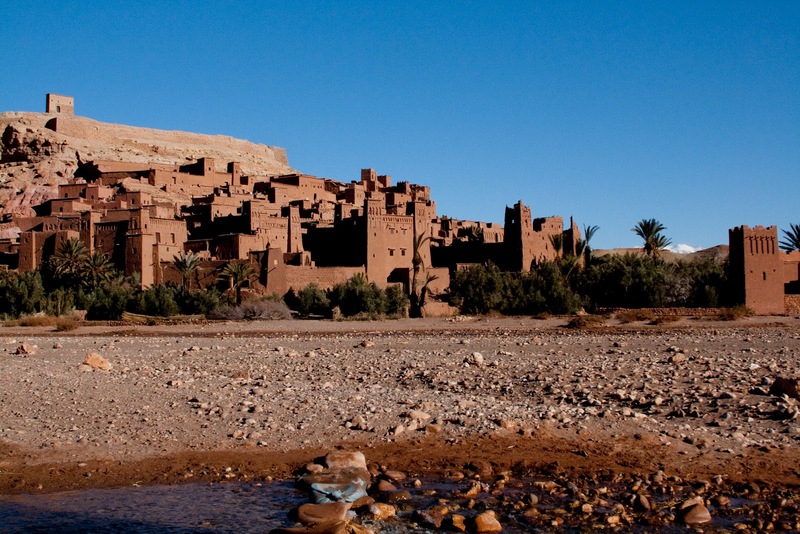 Well I’m sure I don’t remember that …” Max yells with a grin as the freezing wind whips across his face on top of the fortified city of Ait Ben Haddou. To be fair, we might have had that conversation while he was reading his favorite news blogger, who I sometimes refer to as Max’s boyfriend because of the way he so intensely zones out when he reads his blog…but who can say? We have been wanting to see the south of Morocco since we arrived but it was either too hot or too far for a short weekend or too…whatever. But after two months, 8 weeks, 56 days of staying put I was going to burst. Our little car isn’t much, but I was determined to drive it over the Atlas Mountains at least once during our time in Morocco. 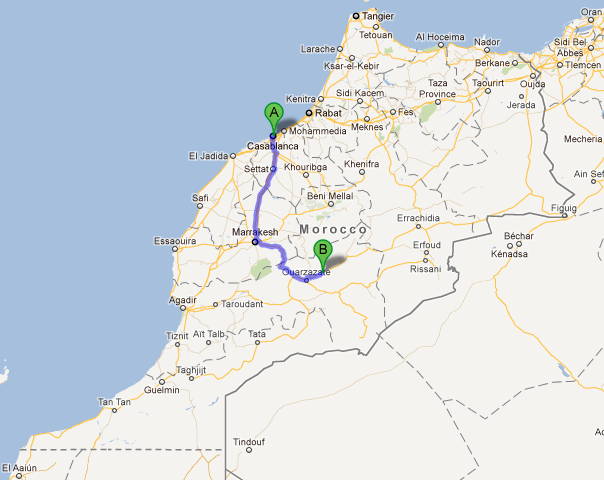 So we got out our maps and plotted a feasible route from Casa to Marrakesh, up and over the Tizi n’Tichka pass, a stopover at Ait Ben Haddou, on through to Ouarzazate and the Skoura Oasis before mounting the Tizi n’Tichka again with a detour to Telouet then through Marrakesh and back home. We drove a lot and, to my shame, were mostly fueled by a pack of fun size Reese’s peanut butter cups my mother sent us for Christmas. The drive over the mountains was stunning. I felt like I made Max stop every ten minutes, but with each new bend I was more and more amazed. We stopped at the peak of the pass to take photos of the snow covered mountain tops and the farms below, but scurried quickly back into our chariot when a mountain Berber got a little too friendly with my waist upon learning I spoke three whole words of Arabic. The landscape quickly changed from rocks and snow and Argan trees to deep red clay stretches of earth and cheeto colored plateaus hovering above small villages. We stopped for some real food before the turn off to Ait Ben Haddou and then trundled along the pise (clay dried road) to what was supposed to be our final destination. The contrasting colors were really something. The Kasbah at Ait Ben Haddou is very impressive. We had to walk across a “bridge” made of large stones and sandbags just to get there. 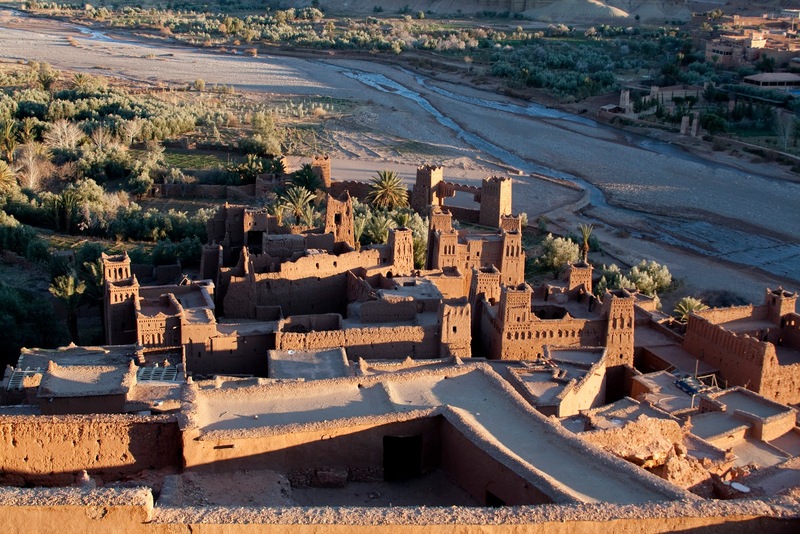 The Ksar became a UNESCO world heritage site in 1987 and our host, Mohammed, told us that renovations have been taking place over the years in order to entice people to come back to what was once their home. These efforts; however, have not really been successful and only 10 families currently live in Ait Ben Haddou. As Max and I scaled the empty Kasbah we began to wonder if the former residents were as spooked by the now empty fortress as we were and perhaps that's why they weren’t returning. But more on that in a bit. 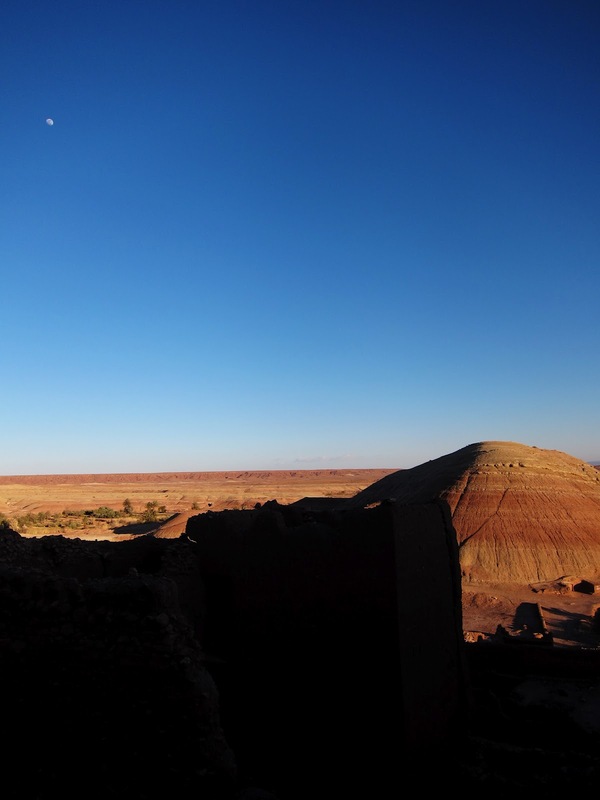 Ait Ben Haddou - recognize the top of the hill from Gladiator? Many films were shot here. Despite a very high potential for hauntedness we stored our gear for the night and headed down to the dining hall for dinner. Mohammed was the only one in the Kasbah besides us that night and he had spent all day preparing a delicious three course Berber meal for us. We ate by candlelight and except for the wailing of Mali’s Tinariwen in the background, I’ve never experienced such silence. Most riad/guesthouse hosts are chatty mcchatty Cathy’s but Mohammed moved silently around the Kasbah with such purpose and such self possession. The night grew even more silent and I couldn’t help but think about those 10 families, including Mohammed, who live in darkness and silence every day. It was actually a really great evening to be still. To invoke a cliché, in our modern world we are hardly ever still. It’s become something I have to learn and relearn from time to time. We loved it. Have I unpacked yet? Of course not. Am I still thawing out from our frozen adventure? Yes, yes, I am. I'll be back with more details of Kasbahs, Gimbris, and Jinn as soon as I kick this High Atlas Mountain cold.